It's the beginning of a new month, so it's time to reveal the next round of the Round Robin quilt! 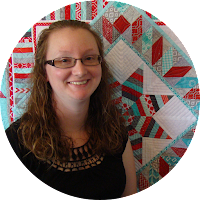 You can read more about the Round Robin quilt that my BQF (best quilty friend), Heather, and I are doing and see our starting blocks here. I'll start with what I added to Heather's block! 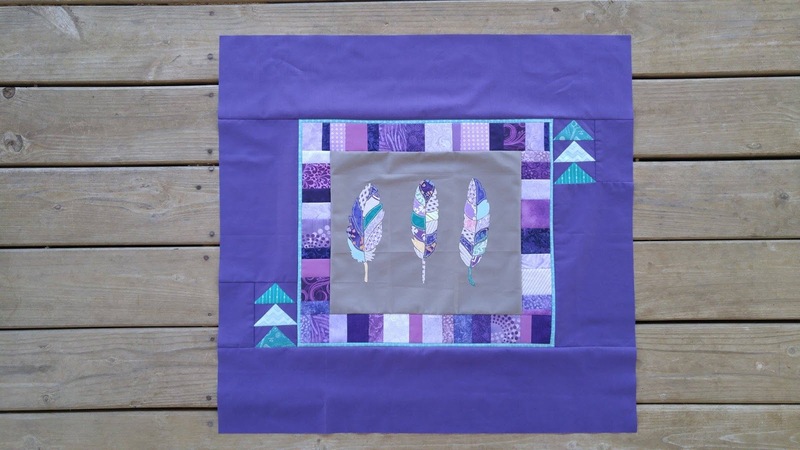 Heather's starting block was appliqued feathers made with scrap pieces in purple, turquoise, and yellow on a solid gray background. 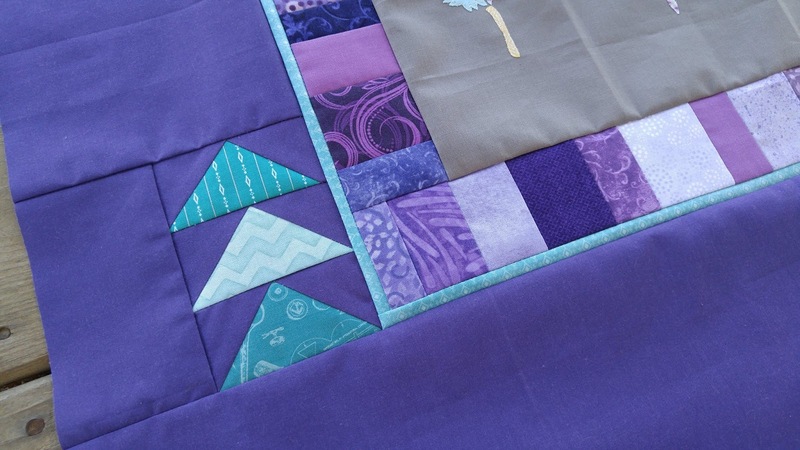 I know Heather's favorite color is purple, so I wanted to emphasize that in my border. When looking through my fabric stash, there were definitely two colors that I had hardly any of: yellow and purple! This gave me an excuse to go fabric shopping! 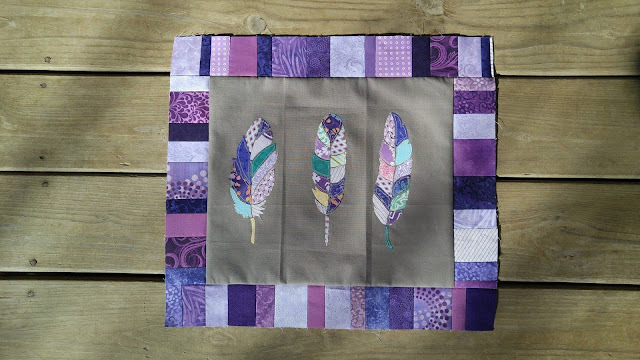 Then I added a 1/4" strip of turquoise fabric to provide a frame and pop of color. 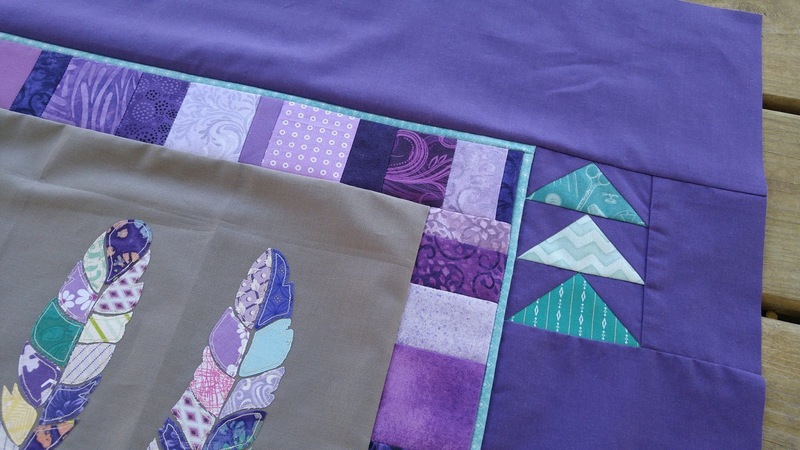 For my final addition, I made six turquoise flying geese blocks on a solid purple. 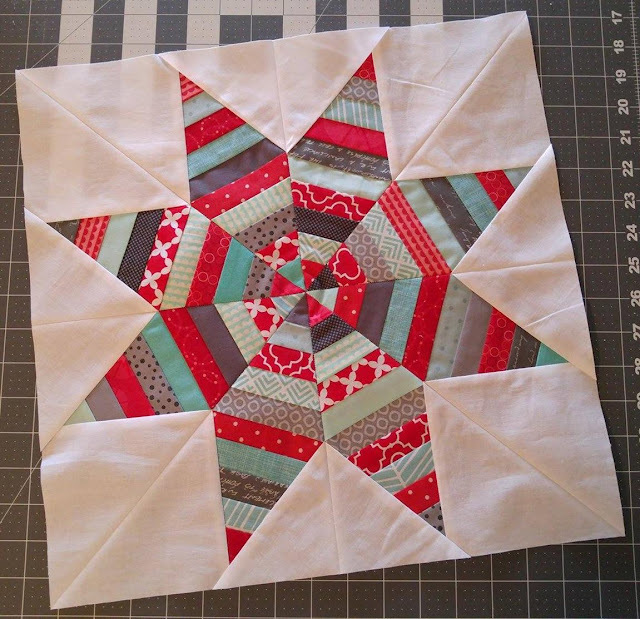 This tied the solid gray of the starting block with the new border. The geese are about 1.5" tall and 3" wide. Our initial rules were to add a border no more than 6" wide. Well, I have a really hard time following rules! In the end, I added what some might consider to be three borders and they total 7.5". Hopefully Heather won't mind! 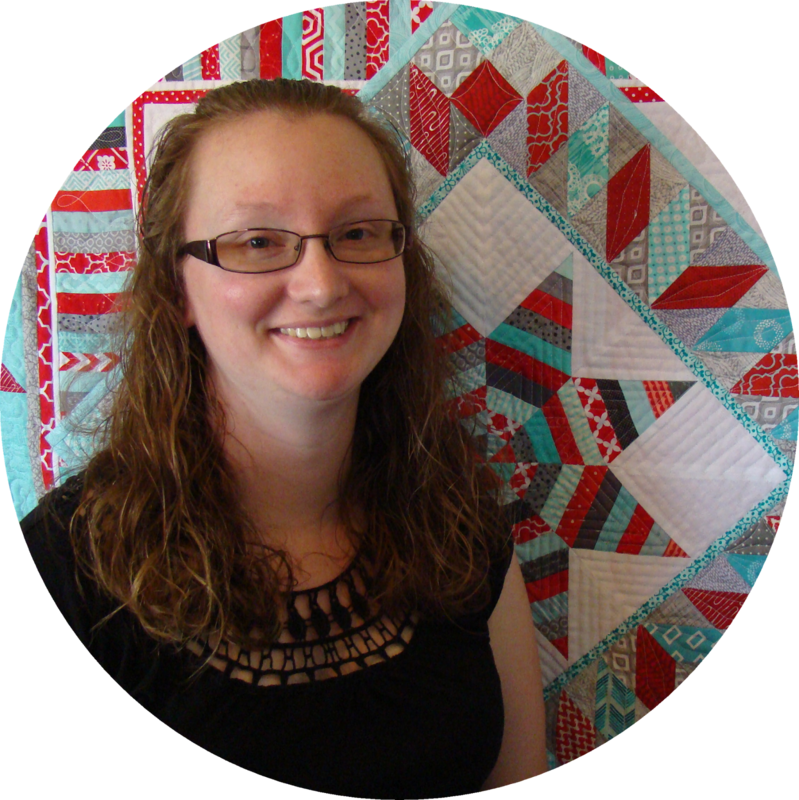 Now for what Heather added to my block! 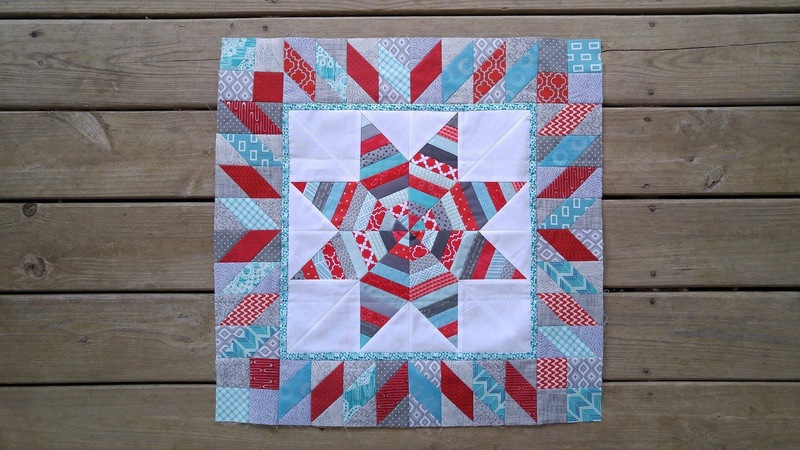 My starting block was a paper pieced string star in aqua, red, and gray on a solid white background. It measured around 16" square. 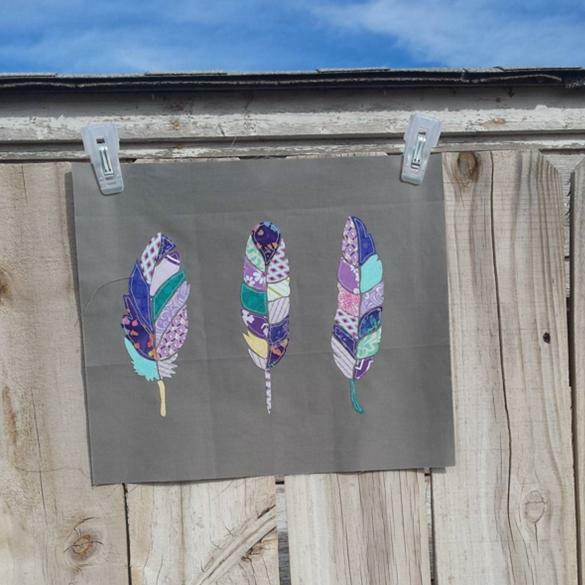 Look how Heather transformed my block! 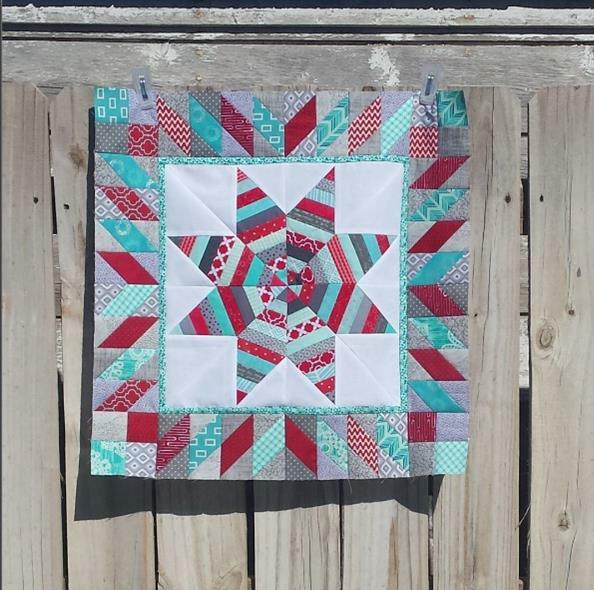 She started by adding a 1/2" aqua border to frame the initial block. 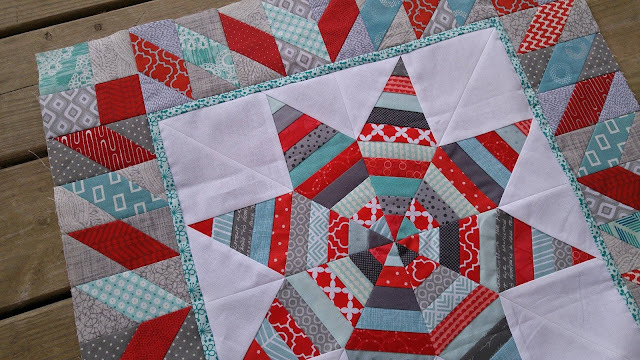 Then she added parallelograms in red and aqua. 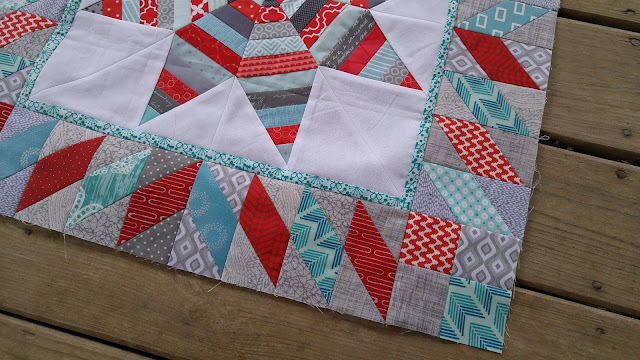 The placement of the gray triangles allow gray to become a background color. The corners are four patches with the same colors. Heather added 4 1/4" to my block, so it now measures just under 24" square. Now, we each have our own blocks back. I love how the blocks really transformed during the first round! Check back around the beginning of next month to see what we each add in the next round! The quilt looks pretty and I especially like the use of the color purple in Heather’s quilt. 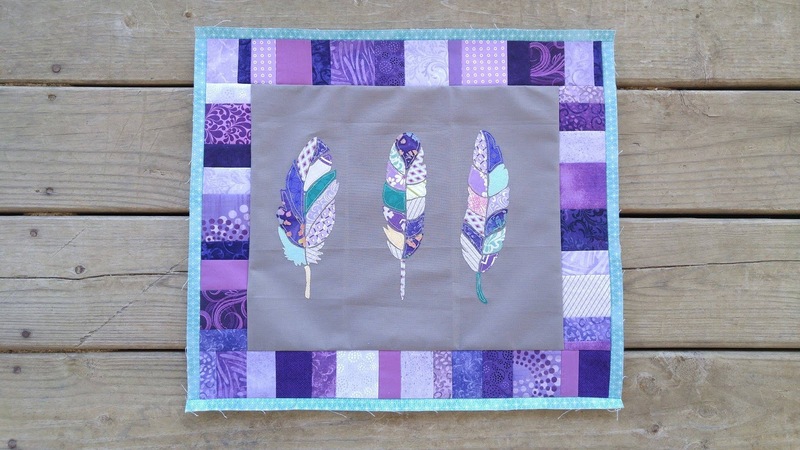 The feather design is pretty and just adds to the beauty of the quilt.